[S296] Will of John Dunscombe. [S180] National Society of the Daughters of the American Revolution, Vol. 92, pg. 34. M, b. circa 1910, d. ? Alexis Bitounis was born circa 1910.1 He married an unknown person. He died in ? [S81] Interview, Kim Hudson, ca. 2001. [S116] Moses S. Beach, Ely ancestry : lineage of Richard Ely of Plymouth., pg. 32. [S116] Moses S. Beach, Ely ancestry : lineage of Richard Ely of Plymouth., pg. 32, 40. [S116] Moses S. Beach, Ely ancestry : lineage of Richard Ely of Plymouth., pg. 32, 36. [S150] Unknown author, History of the Ely re-union, held at Lyme, Conn., July 10th, 1878, pg. 47. [S116] Moses S. Beach, Ely ancestry : lineage of Richard Ely of Plymouth., pg. 44. [S116] Moses S. Beach, Ely ancestry : lineage of Richard Ely of Plymouth. [S116] Moses S. Beach, Ely ancestry : lineage of Richard Ely of Plymouth., pg. 36. [S116] Moses S. Beach, Ely ancestry : lineage of Richard Ely of Plymouth., pg. xxv. [S116] Moses S. Beach, Ely ancestry : lineage of Richard Ely of Plymouth., pg. 39. [S116] Moses S. Beach, Ely ancestry : lineage of Richard Ely of Plymouth., pg. 38. [S116] Moses S. Beach, Ely ancestry : lineage of Richard Ely of Plymouth., pg. 38, 48. [S116] Moses S. Beach, Ely ancestry : lineage of Richard Ely of Plymouth., pg. 38, 55. [S116] Moses S. Beach, Ely ancestry : lineage of Richard Ely of Plymouth., pg. 55. Father* John Dunbar1 b. circa 1725, d. ? Lyman Dunbar2 b. circa 1780, d. ? [S291] Donald Lines. Jacobus, Families of ancient New Haven. [S290] Tom. Dunbar, "Correspondence from Tom Dunbar.," e-mail to Edward. Dunscombe, August 12, 2004. [S473] Unknown author, "unknown essay title," Barbour collection of Connecticut Town Vital Records, Wallingford. Mary Potter was born circa 1749/50.3 She married Aaron Dunbar, son of John Dunbar, circa 1770.3,2 Mary Potter died ?unknown. Lyman Dunbar1 b. circa 1780, d. ? John Goodwin was born circa 1749/50.1 He married Susannah (?) circa 1770.1 John Goodwin died ?unknown. [S264] Unknown author, World Family Tree # 5738. Susannah (?) was born circa 1749/50.1 She married John Goodwin circa 1770.1 Susannah (?) died ?unknown. Dr. John Simpkins Butler was born circa 1800.1 He married Cordelia Williams circa 1830.1 Dr. John Simpkins Butler died ?unknown. [S116] Moses S. Beach, Ely ancestry : lineage of Richard Ely of Plymouth., 383. Maria Hopkins was born circa 1790.1 She married Matthew Rice Dutton circa 1815.2 Maria Hopkins died ?unknown. [S116] Moses S. Beach, Ely ancestry : lineage of Richard Ely of Plymouth., pg. 383. Cordelia Williams was born circa 1805.1 She married Dr. John Simpkins Butler circa 1830.1 Cordelia Williams died ?unknown. Joseph Mauran was born circa 1800.1 He married Sophie Russell Sterry circa 1830.1 Joseph Mauran died ?unknown. [S116] Moses S. Beach, Ely ancestry : lineage of Richard Ely of Plymouth., pg. 384. John William Schmidt was born circa 1800.1 He married Mary Elizabeth Baker circa 1830.1 John William Schmidt died ?unknown. [S116] Moses S. Beach, Ely ancestry : lineage of Richard Ely of Plymouth., 384. Mary Elizabeth Baker was born circa 1805.1 She married John William Schmidt circa 1830.1 Mary Elizabeth Baker died ?unknown. Gideon Eldridge was born circa 1800.1 He married Phebe Ann White circa 1835.1 Gideon Eldridge died ?unknown. Phebe Ann White was born circa 1805.1 She married Gideon Eldridge circa 1835.1 Phebe Ann White died ?unknown. Francis Cabot Lowell was born circa 1815.1 He married Mary Lowell Gardner circa 1840.1 Francis Cabot Lowell died ?unknown. Mary Lowell Gardner was born circa 1820.1 She married Francis Cabot Lowell circa 1840.2 Mary Lowell Gardner died ?unknown. 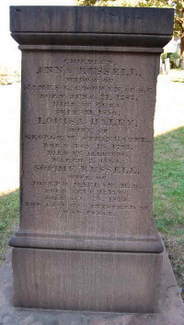 Charles Bulkeley Colt was born on August 11, 1786.1 He died ?unknown. [S196] D. L. Jacobus, Reverend Peter Bulkeley : being an account of his career, his ancestors, and ancestors of his two wives, and his relatives in England and New England, with a genealogy of his descendants., 298. [S196] D. L. Jacobus, Reverend Peter Bulkeley : being an account of his career, his ancestors, and ancestors of his two wives, and his relatives in England and New England, with a genealogy of his descendants. [S196] D. L. Jacobus, Reverend Peter Bulkeley : being an account of his career, his ancestors, and ancestors of his two wives, and his relatives in England and New England, with a genealogy of his descendants., 175. [S196] D. L. Jacobus, Reverend Peter Bulkeley : being an account of his career, his ancestors, and ancestors of his two wives, and his relatives in England and New England, with a genealogy of his descendants., pg. 175. [S196] D. L. Jacobus, Reverend Peter Bulkeley : being an account of his career, his ancestors, and ancestors of his two wives, and his relatives in England and New England, with a genealogy of his descendants., 176. [S223] Unknown author, USGenweb site. [S196] D. L. Jacobus, Reverend Peter Bulkeley : being an account of his career, his ancestors, and ancestors of his two wives, and his relatives in England and New England, with a genealogy of his descendants., pg. 176.